What is well being? Well being is the quality of life, the state of being well. Well being means physical, mental, and social health as well as a acceptable standard of living, ability to contribute to society, and access to goods and services needed. It also means, less tangibly: happiness, freedom, culture, education and environment. 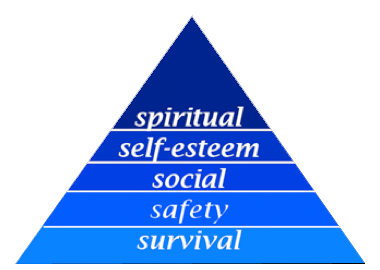 Psychologist Abraham Maslow’s Hierarchy of Needs is a theory, or idea, of five progressive human needs and desires: survival, safety, social, self-esteem and spiritual. 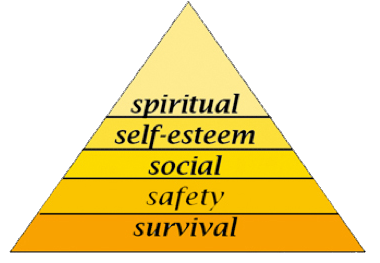 Maslow observed that lower needs needed to be met first before a person could aspire or be motivated to achieve higher desires. Not all people can achieve the highest, or spiritual level. Only 1/3 of the world’s population has access to clean water; many people do not have access to food, shelter or homes. Those who are able to meet basic needs of survival, shelter, and security, progress to desiring social relationships, development of self-esteem and spirituality. Using Maslow’s pyramid, list which needs and desires you currently have fulfilled and how they are fulfilled. Think of what would motivate you to deepen your achievement in the five levels. Label your pyramid and paste it in your journal. 1. Survival (physiological needs): air, water, food, temperature, shelter. Safety: safety from violence and aggression, secure health, steady income, shelter, and food supply, job security, safety and security for family. When physiological needs are met, the desire for safety and security emerges. Social: People desire to feel needed, to feel loved, accepted, and to belong to a group such as a family, club, community. When these feelings are missing, people are likely to suffer alienation, loneliness, social anxiety and depression. Self-esteem: The need for self-respect, to be respected, and to respect others establishes self-worth and integrity. Spiritual: Once all other needs and desires are satisfied, people are motivated to become creative, understand life, think about how the world works and to appreciate life. What makes you feel comfortable? What does human comfort mean? Where is the place of comfort in human well-being? How do you define comfortable? A closer look at the human well-being triangle reveals a zone in which most people feel comfortable. This definition of comfort is relatively new in human evolution. Hand held fans and fires predate our electric fans and furnaces keeping us warm in winter and cool in summer. Today’s definition of ultimate comfort 24/7 three hundred sixty-five days of the year didn’t exist for most people before the 1800s. Early civilizations built courtyard homes to promote air movement between sunny or shaded courts and interior spaces. The advent of air conditioning and HVAC (Heating, Ventilating, Air Conditioning) building systems brought modern climatization to buildings all over the world. Today’s buildings use energy to modify outdoor air movement temperature and humidity to standards that scientists developed as optimal. Today’s definition of acceptable comfort in 21st-century buildings includes 40-60% humidity, or moisture in the air; 68-80 degrees Fahrenheit range of temperature; and 20-40% air movement. Too little air movement and spaces begin to have odors and feel stuffy; too much air movement and we feel a draft and are chilled. Map human comfort! How lucky are you today? Do you have food to eat, clean water to drink, and a warm house over your head? Do you feel comfortable? Surprisingly enough, our understanding of comfort has changed radically in the last 150 years. Things that we take for granted like running water, refrigeration, heat, washing machines, and even cars, did not exist then. Research what the world was like when your great grandparents were born. Were there trains, planes and automobiles? How did they get around? Where did they get their food? How did they heat their houses and wash their clothes? Make a poster of then and now. What do you think has improved? Is everything better? Has anything gotten worse? How do we define progress? Think about it! 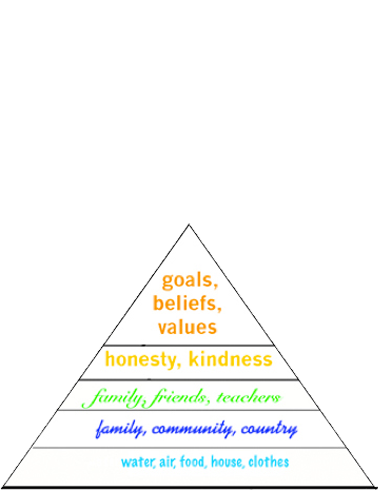 Using the well being triangle, research the percentage of population where you live that is: without clean water without shelter (homeless) without food You may be surprised to learn that these problems exist close to home. Next, find out what organizations are assisting to change these percentages. Are there soup kitchens, or food drives? Are their clothing drives for shelters for homeless people. Is there a chapter of Habitat for Humanity in your town? Write a report about well being, considering things all people need to live comfortably and to prosper. Write about the social organizations that assist everyone reaching these goals. Now that you have a better idea about the population in your city, how about looking at world population? Which countries have the most people without access to clean water? Which ones have the most homeless people? Research on the internet maps of global health. Next, take the Earth Day Ecological Footprint Quiz. How many planets earth would it take if everyone lived like you? Safety is the primary need of people. Who created the well-being triangle? Improvement in which area is initially most important for world survival?